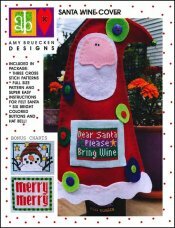 Santa Wine Cover [E1276] - $16.00 : Yarn Tree, Your wholesale source for cross stitch supplies. Cross stitch pattern Amy Bruecken Designs. Do you have a special person that you enjoy gifting wine to for Christmas? This would be a great gift to make for them! On the front of the Santa is stitched, "Dear Santa Please Bring Wine." Stitch count not listed. Included with the pattern is colored buttons and a hat bell!